New embroidered piece and a memory piece. 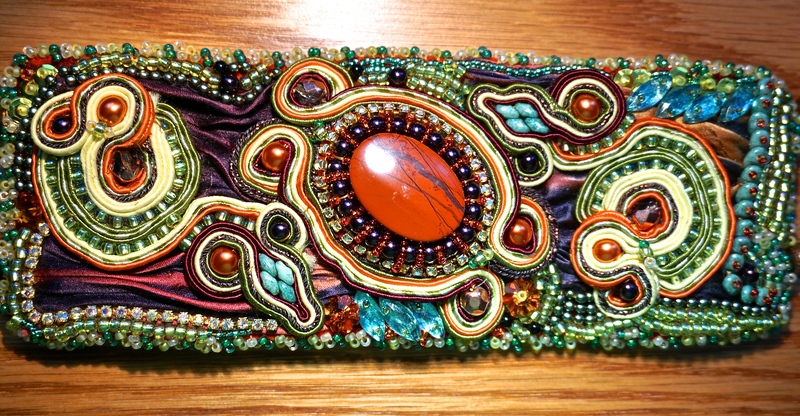 I have not been terribly busy with my beadwork but that will change. Here is what I have on my bench right now. I have tentatively named it “Arizona Sunrise”. I love working with Shibori ribbon and, of course, lots of crystals and bling. My new bling love is Swarovski Elements cup chain. I scored the orange in gunmetal one in the picture from http://www.grainofsand.com and it was a closeout. They are my go to site for vintage sequins too. My little African Grey, Charlie is getting used to being alone. He and Oliver were good buddies. The good news he is becoming friendlier to me. Tuce, the Blue and Gold Macaw is kind of oblivious and my precious Blue Front Amazon, Murphy, appears to be happy. Murphy, aka Green Bird, is now #1 bird in the flock. A much coveted position. And finally, Rita, our guest eclectus, seemed the most affected by Oliver’s death. She went silent for 4 days after he died. And she is never, ever silent. She talks almost constantly. She has since resumed her conversations, but I thought it was a strange reaction from her, she knew Oliver only 5 months. No telling with animals. Our black lab, Rudy, sniffed Oliver’s body and became very very upset. OK, enough about death. Life goes on. My heart will always be sore for my Oliver and I have not finished grieving by a long run. But we move on, one day at a time, always moving and looking forward. Decided to put beading on the shelf for awhile. I’m not feeling very successful and also decided to close up my blog shop.